A water gun-based action shooting game. The latest Senran Kagura game is an action shooting game called Senran Kagura: Peach Beach Splash for PlayStation 4, the latest issue of Weekly Famitsu reveals. It will launch on March 16 in Japan. In it, players will use a water gun and partake in exciting team battles. Weekly Famitsu has an outline of the game, as well as an interview with producer Kenichiro Takaki and information on the limited editions and first-print bonuses, but further details have yet to leak. Update 7:40 a.m.: Senran Kagura: Peach Beach Splash is a third-person shooter. Peach Beach Splash is the name of a mysterious water gun tournament from the ancient days in the world of the shinboi. The game disregards entirely the characters’ standpoints of good shinobi or bad shinobi, and their special abilities as shinobi are disabled as victory can only be attained through the use of water guns. Weapons include dual pistols, Gatling guns, sniper rifles, and various other types of water guns. You can also set cards that grant these weapons skills and special ability effects. Battles are five-on-five team-based fights using water guns. There is online multiplayer in addition to a story mode, and the game will feature over 30 characters, plus α (Editor’s note: I’m not sure what this is referring to.) The series’ mainstay finishing techniques will also appear further enhanced in Peach Beach Splash. 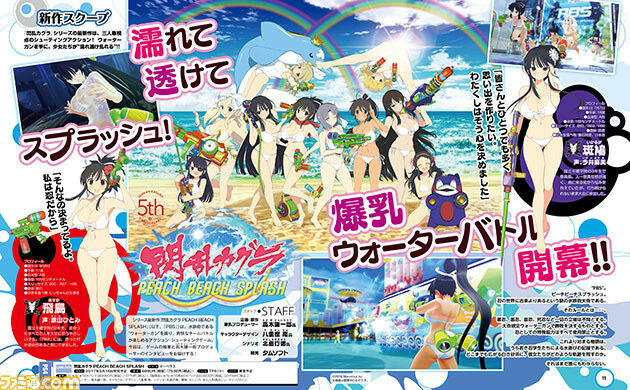 The story of Peach Beach Splash is part of the main storyline. There are plans to develop a new Senran Kagura from this title. There will also be a new Senran Kagura action game in the future. There are plans to include popular characters and such from the mobile game Senran Kagura: New Wave G Burst. Takaki wants to finally put the series in one big world. The game is being made so that both beginners and advanced players can enjoy it. They are considering the extent that players can intervene when it comes to costume destruction. The amount of costumes worth getting wet have increased. There’s also a considerable volume of swimsuits. There are plans to support PlayStation VR with some modes. Support may be added in an update after the release. There are about 10 types of water guns. There are plans for downloadable content that adds stories, costumes, and characters. They want to do collaborations, too. Update 10/5/16 at 10:50 p.m.: Get the first high-res screenshots and more information about the limited editions here.